As illustrated in the figure on the right, StarBED mainly consists of the following three groups. It consists of about 1,000 servers. For details, please refer to the tables below. Used to control the experiment nodes. Provides a bidirectional communication between experiment nodes through a network backbone of up to 200 Gbps. The experiment network connects the experiment nodes via experiment switches, creating an environment which is independent from other networks and that makes possible highly-dependable network experiments and verification. When using the StarBED equipment for experiment and verification, testbed users can access it not only from inside our center, but also externally through the Internet and VPN. 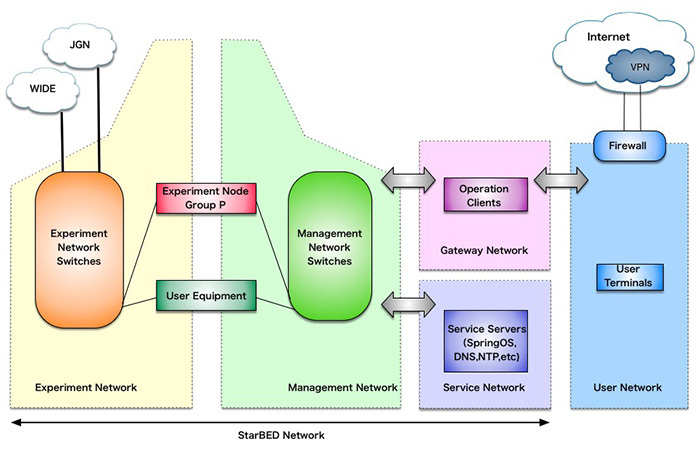 Moreover, the StarBED experiment environment can also be connected to JGN-X*, WIDE** and other research networks. The experiment nodes are divided into some groups, as shown in the table below.